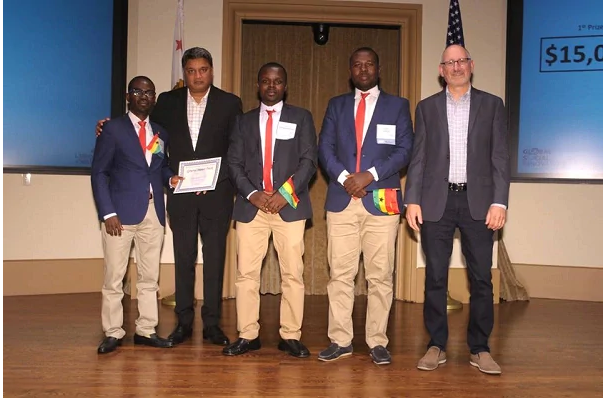 Three students from the Heritage Christian College (HCC), Ghana, won the 2018 Global Social Innovation Challenge held at the University of San Diego, United States of America (USA). The three Ghanaian students named, Evans Kwakye, Benjamin Nketsia and Austin Carboo emerged as winners after a great presentation on Ghana’s sanitation issues. The Ghanaian team known as “Team Charcoal” presented a solution to the sanitation challenge in Ghana by transforming human feces into charcoal. 51 teams from across 27 Universities in 12 countries participated in the Global Social Innovation Challenge. The Challenge, which is an initiative of the University of San Diego's Centre for Peace and Commerce, is geared towards rewarding student-led social ventures focused on sustainable change. The Ghanaian team received $1,500 and $15,000 as seed funds for winning both the Audience Choice Award and the Overall Grand Prize in the General Track categories respectively. He added that the team is in partnership with some reputable number of companies who will assist them in case of any technicality. Mr. Alexander Asmah, mentor of Team Charcoal stated that the team focused on charcoal generation because charcoal is widely used even outside the continent and this will help lessen the cutting down of trees for the usage of charcoal and that the team’s goal after the win is to find investors to make their innovation a reality.